Hi everyone - hope you're having a fantastic weekend! My kiddies are a bit crazy today, so I'm taking a break to do a blog post! 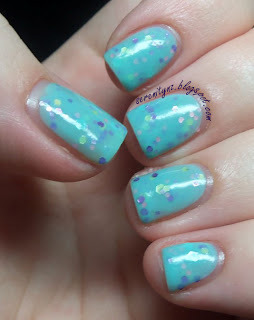 :P This polish is from Happy Hands' spring collection. 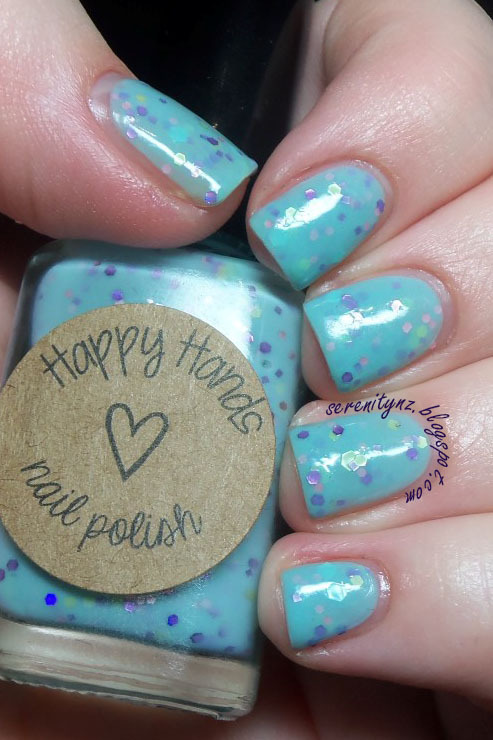 Sweet Dreams is described as a "dreamy aqua blue jelly with pastel green, pink, aqua and holographic purple glitters." Such a cute color! These swatches show three coats, plus one coat of topcoat, but this polish would also be great layered over a similar shade. I didn't have to do any fishing for this amount of glitter which I thought was pretty good! Happy Hands is available internationally from: Harlow & Co, Happy Hands store, Etsy, and Mei Mei Signatures.